Refreshing selection of inspiring piano orchestral music, a perfect companion with which to brighten any day. 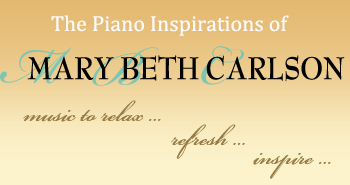 Faith, Hope & Love, is a brand new solo piano recording of time-honored hymns and a praise and worship song, "What a Beautiful Name", that has become very meaningful to Mary Beth. Amazing Grace is an intimate and inspiring solo piano collection of some of the best loved hymns and worship songs of all time, soulfully arranged and performed by Mary Beth to accompany your time with God and to honor and glorify Him. Faith ... Psalms, Hymns and Spiritual Songs is a collection of familiar inspirational favorites that will captivate, refresh and lift the spirits of each listener. Music from In The Garden...healing songs of comfort and peace has been specially selected from our collection of piano orchestral inspirational songs because of their themes of peace, contentment, hope and encouragement. In This Quiet Place is a haven of rest that will refresh and renew your spirit with its peaceful yet impassioned collection of inspirational favorites. Nature's Song, a refreshing, captivating collection of piano orchestrations, is a musical journey through themes celebrating God's beautiful gift of creation and the inspiration we receive from His blessings of peace, hope and love. Let this music take you to places of comfort and contentment! Peacegiver includes a collection of deeply moving inspirational music that will guide listeners to a place of harmony and tranquility. Reflections...songs for the heart and soul features a blend of impassioned piano orchestral selections by Mary Beth and stunning vocal performances by award-winning tenor vocalist Mark David Williams. Sanctuary ... inspiring songs of peace, praise and worship provides a comforting refuge of rest, renewal, peace and contentment. Over 70 minutes of deeply moving music. Whisper Hope promises an unforgettable listening experience with familiar traditional hymns, refreshing contemporary choruses and deeply personal original compositions by Mary Beth that will captivate, comfort and inspire.